The National Disaster Management Authority (NDMA) today called on a meeting to discuss the formulation of a National Landslide Risk Management Strategy. This was the first meeting of the task force of landslide experts created for preparing an effective national strategy for landslide risk management. The task force consists of six sub-groups specific to different aspects of landslide risk management strategy - generation of user friendly landslide susceptibility maps; development of monitoring and early warning system; awareness generation; capacity building & training; preparation of mountain zone regulations and policies; mitigation of landslides and creation of special purpose vehicle / centre for landslide management. Inaugurating the meeting, Lt. Gen. N.C. Marwah, Member, NDMA, said the task force may submit its proposals which could be taken up immediately to prepare a national strategy for quick implementation. Underlining the importance of strengthening the early warning, preparedness, prevention and mitigation efforts, Dr. Saibal Ghosh, Director, Geological Survey of India (GSI) informed that the number of casualties in landslides can be prevented if the country has a detailed and uniform landslide hazard mapping for use of community that takes into account all the elements of risk such as settlements, population, infrastructure, etc. The meeting also emphasized upon the need to develop landslide Early Warning System (EWS) and integrating the usage of latest technological tools such as wireless sensor networks and web-based GIS interface to ensure that the information reaches the last man on time. A comprehensive plan on capacity building, training of stakeholders and preparation of mountain zone regulations and policies would be other key areas of the strategy. 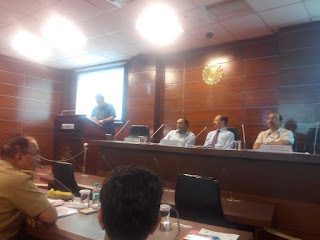 Prof. R. B. Singh, Delhi University emphasized upon the need for extensive information, education and communication campaigns to create awareness among people about preparedness, do's and don'ts and response. This will lead to active participation of the communities and other stakeholders. With new technologies such as mobile phone apps and online portals easily available, it is easier than ever before to reach out to the youth in schools and colleges, Dr. Singh said. Scientists, academicians and experts from various Departments, Institutes and State Governments apprised NDMA of the work already done by them in the area of landslide risk mitigation. Advising the States to draw their strategy on landslides in line with the broad framework given by NDMA, the Authority said the Landslide Risk Management Strategy will also incorporate the priority areas as indicated in the Sendai Framework for Disaster Risk Reduction. The meeting was attended by subject experts from various educational institutions and organisations such as Council for Scientific and Industrial Research (CSIR), Indian Institute of Remote Sensing (IIRS)-ISRO, Uttar Pradesh Remote Sensing Application Centre (UPRSAC), G.B. Pant National Institute of Himalayan Environment and Sustainable Development (GBPNIHE&SD), Defence Terrain Research Laboratory (DTRL)-DRDO and Border Roads Organisation (BRO) apart from senior officials from NDMA. Landslides affect about 15 percent of India's landmass and cause destruction and losses of varying degrees in at least 22 States and Union Territories. Comment : Am a part of the Task Force convened for the above purpose.